Jonathan Lucroy was a frequent guest of FanGraphs this season, but we left him on his own here at RotoGraphs. It’s not like he was ever on the waiver wire. FantasyPros recorded a price range of $3 to $24 for Lucroy, averaging $12. You can bet that will increase next year after turning in a $16 season per Zach Sanders. The 28-year-old had the catcher version of a five-category season – 73 runs, 13 home runs, 69 RBI, four stolen bases, and a .301 average. With just a five percent swinging strike rate, he’s trimmed his strikeout rate below 11 percent while his walk rate rose above 10 percent. Could we be looking at a right-handed Victor Martinez? It was a record season for Lucroy – albeit the record in question is somewhat obscure. He belted the most doubles as a catcher – 46 of his 53 total two baggers. Unless you’re playing in one of those wonky 20 category leagues or a linear weights format, doubles probably don’t mean much to you. If we squint, his doubles total provides the potential for further optimism. His HR/FB ratio was just 7.1 percent. It’s never been below 10 percent in a full season. His average fly ball distance was 283 feet. If you recall from yesterday, Brian McCann socked 23 home runs with a 280 foot average fly ball. And lest you think it’s purely park effects, Miller Park is quite home run friendly. He managed 655 plate appearances by mixing in some time at first base. Catchers simply don’t play this often, which gives Lucroy special value. Usually you have to find a catcher eligible first baseman or designated hitter if you want 650 plate appearances from one guy. Per a quick manual calculation, only Buster Posey, Salvador Perez, and Carlos Santana had a similar volume of work while maintaining catcher eligibility. 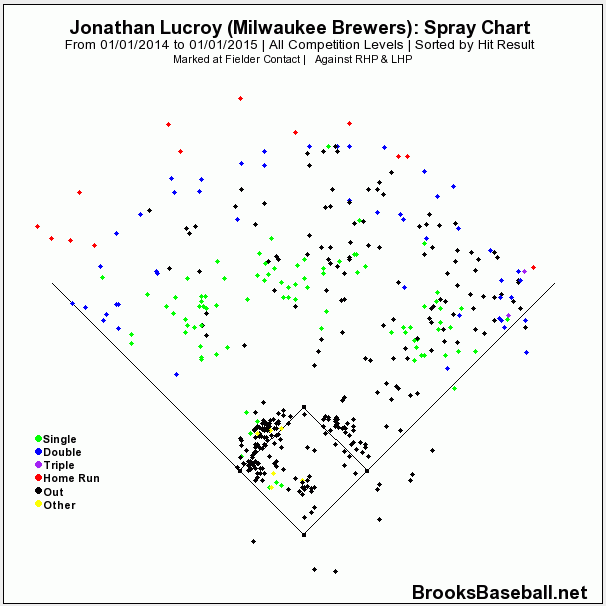 Check out Lucroy’s spray chart for 2014, sorted by hit result. In a world where shifts are king, Lucroy does most of his damage to the opposite field. He does pull his share of infield grounders, but his controlled stroke is probably enough to prevent teams from employing the righty shift. As such, his .324 BABIP does not appear unreasonable. We should probably expect a batting average in the range of .280 to .320. In other words, we can get a good to elite rate stat from a catcher, and he’ll bat enough to give it weight. The Brewers often mixed and matched their lineup, with Lucroy seeming to fit anywhere between second and fifth. We know some combination of Lucroy, Ryan Braun, and Carlos Gomez will work at the top of the order next season, making the Milwaukee lineup a dynamic threat once again. Lucroy was the only one to remain healthy this season. A bounce back from Braun in particular could improve Lucroy’s game. It’s way too early to set a price for Lucroy in 2015. Even if I’m accurate, we’ll all forget about it by the time it’s March. 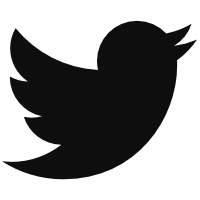 However, it’s appropriate to end these analyses with a nod to the future. Steamer 600 expects some regression with a .281/.347/.431 line with 11 home runs in 450 plate appearances. The system is designed to ding catchers on playing time, so we can guestimate about 15 home runs for Lucroy in a 600 plate appearance season. If we assume health, I would look at the Steamer projection as a floor. Of course, it’s never wise to assume health when building a fantasy roster. Anyone can get hurt, especially catchers. In many ways, fantasy owners are lucky Lucroy’s doubles didn’t leave the yard more often. It could keep the catcher’s price tag to a reasonable level. I expect you’ll have to be aggressive and overpay to acquire him, but the cost of acquisition might not be onerous. And it’s so nice to solve a catcher spot with just one guy. You’ll free up another roster spot for a reliever or utility man with a Lucroy hire. We hoped you liked reading Doubling Up With Jonathan Lucroy by Brad Johnson! The worst thing Lucroy did was go 5-8 on the last two days to bring his average above .300. He also stole candy from a baby. But you’re right, the 5-8 was much worse.